, an English poet, was son of a citizen of London, and born at Marlborough in Wiltshire July 29, 1677. 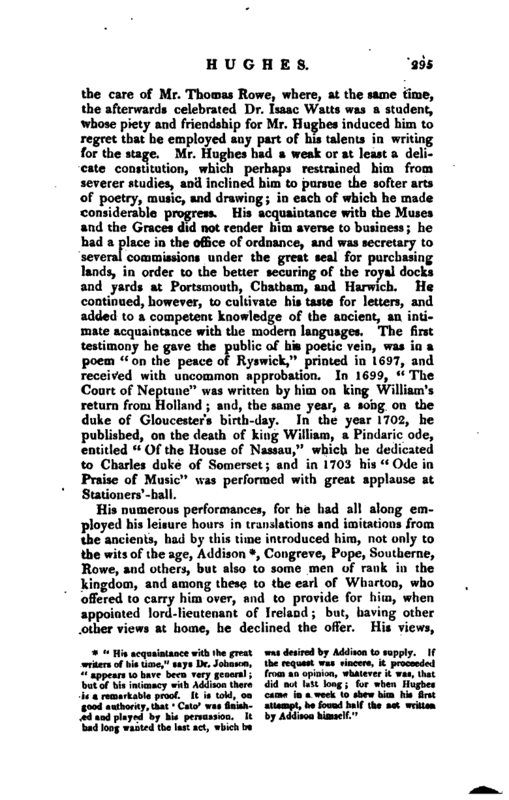 He was educated at a dissenting academy, under | the care of Mr. Thomas Rowe, where, at the same time, the afterwards celebrated Dr. Isaac Watts was a student, whose piety and friendship for Mr. Hughes induced him to regret that he employed any part of his talents in writing for the stage. Mr. Hughes had a weak or at least a delicate constitution, which perhaps restrained him from severer studies, and inclined him to pursue the softer arts of poetry, music, and drawing; in each of which he made considerable progress. Hk acquaintance with the Muses and the Graces did not render him averse to business; he had a place in the office of ordnance, and was secretary to several commissions under the great seal for purchasing lands, in order to the better securing of the royal docks and yards at Portsmouth, Chatham, and Harwich. He continued, however, to cultivate his taste for letters, and added to a competent knowledge of the ancient, an intimate acquaintance with the modern languages. The first testimony he gave the public of his poetic vein, was in a poesi “on the peace of Ryswick,” printed in 1697, and received with uncommon approbation. In 1699, “The Court of Neptune” was written by him on king William’s return from Holland; and, the same year, a song on the duke of Gloucester’s birth-day. In the year 1702, he published, on the death of king William, a Pindaric ode, entitled “Of the House of Nassau,” which he dedicated to Charles duke of Somerset and in 1703 his “Ode in Praise of Music” was performed with great applause at Stationers’-hall. Congreve, Pope, Southerne, Rowe, and others, but also to some men of rank in the kingdom, and among these to the earl of Wharton, who offered to carry him over, and to provide for him, when appointed lord-lieutenant of Ireland; but, having other other views at home, he declined the offer. His views, | however, were not very promising, until in 1717 the lord chancellor Cowper made him secretary to the commissions of the peace; in which he afterwards, by a particular request, desired his successor, lord Parker, to continue him. He had now affluence; but such is human life, that he had it when his declining health could neither allow him long possession nor full enjoyment. His last work was his tragedy, “The Siege of Damascus;” after which a Siege became a popular title. This play was long popular, and is still occasionally produced; but is not acted or printed according to the author’s original draught, or his settled intention. He had made Phocyas apostatize from his religion; after which the abhorrence of Eudocia would have been reasonable, his misery would have been just, and the horrors of his repentance exemplary. 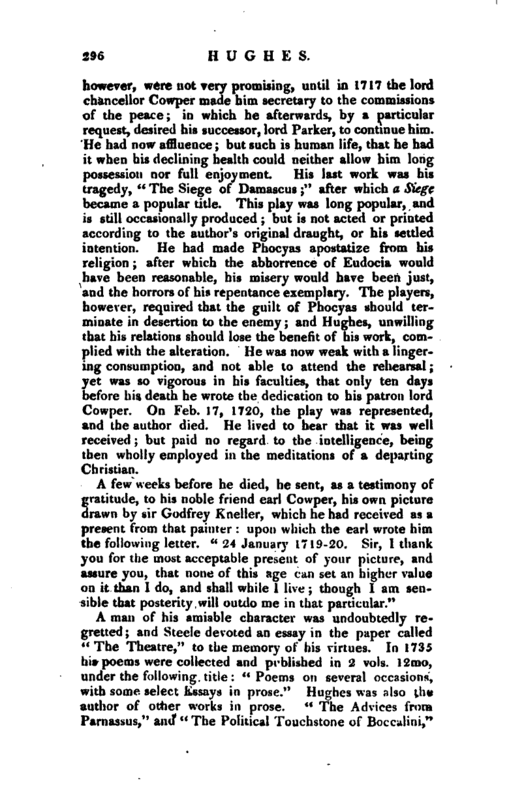 The players, however, required that the guilt of Phocyas should terminate in desertion to the enemy; and Hughes, unwilling that his relations should lose the benefit of his work, complied with the alteration. He was now weak with a lingering consumption, and not able to attend the rehearsal; yet was so vigorous in his faculties, that only ten days before his death he wrote the dedication to his patron lord Cowper. 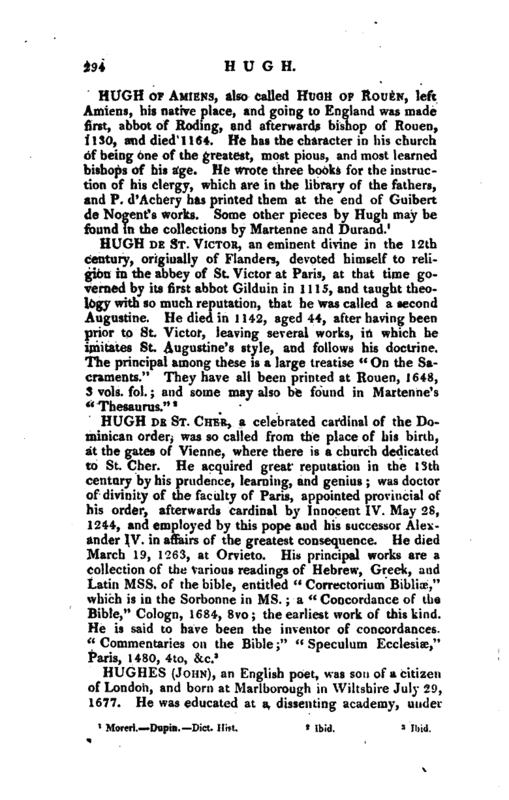 On Feb. 17, 1720, the play was represented, and the author died. He lived ta hear that it was well received; but paid no regard to the intelligence, being then wholly employed in the meditations of a departing Christian. Biog. Brit. 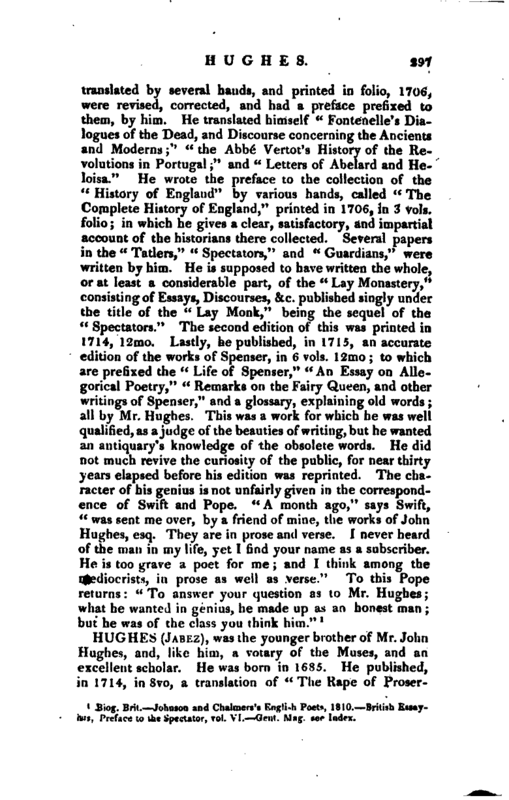 Johnson and Chalmers’s English Poets, 1810. British Essayists, Preface to the Spectator, vol. VI. —Gent. Mag. see Index.